Measurement: Comparing an unknown quantity with some known quantity is called measurement. Result of Measurement: The result of measurement has two parts; one part is the number and another part is the unit. The known quantity which is used in measurement is called a unit. For example; when you say that your height is 150 cm then the measurement of your height is being expressed in a number, i.e. 150 and a unit, i.e. centimeter. Arbitrary Units of Measurement: Before the development of standard units of measurement, people used arbitrary units of measurement. Some of them are still in use at some places. 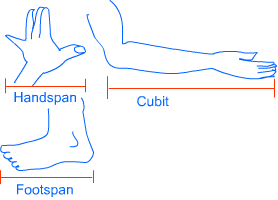 Handspan, finger-length, cubit (length between the elbow and finger tips), foot-length and arms-length are some examples of arbitrary units of measurement. Disadvantages of Arbitrary Units of Measurement: You have seen that arbitrary units are made up of lengths of different body parts. These lengths can vary from one person to another. This can create lot of confusion as there would be no uniformity in measurement. To maintain uniformity in measurement, standard units of measurement were introduced in different parts of the world at different places. Napoleon is believed to have introduced most of the standard units of measurement which are being used today. SI Unit (International System of Units): It is the most widely used system of measurement in the world. It is based on MKS (Meter-Kilogram-Second) System. Length, weight and time are considered as basic quantities for measurement and other quantities are derived from them. As per SI system; the unit of length is meter, unit of weight is kilogram and the unit of time is second. Barring the unit of time, other units of this system are based on decimal system. Use of the decimal system makes the SI Unit more user-friendly. Direct Measurement: When we measure some quantity directly, it is called direct measurement. For example; when you are using a ruler to measure a length, you are doing direct measurement. Indirect Measurement: When we measure some quantity indirectly, it is called indirect measurement. For example; when you have to measure the girth of a tree or the length of a curve, you cannot use a ruler. You can use a rope to find the length of a curved line and then compare the length on a ruler. The scale should be placed along the length of the object to be measured. The zero mark of the scale should be taken as the beginning point. If zero mark is broken or invisible, then any other mark should be selected and final adjustment should be made accordingly. For example; if you begin from 1 and the final reading is 14 then actual reading would be 14 – 1 = 13. Correct eye position should be maintained. The eye position should be just above the point to be measured. Incorrect eye position leads to parallax error and gives incorrect reading. Motion: The change in position of an object with change in time is called motion. Linear Motion: When the motion is in a straight line, it is called linear motion, e.g. a car moving on a straight road. Curvilinear Motion: When the motion is on a curved path, it is called curvilinear motion, e.g. a car moving on a bend. Circular Motion: When the motion is on a circular path, it is called circular motion, e.g. the motion of the earth in its orbit. Rotation: When an object moved around an axis, it is called rotation, e.g. rotation of the earth on its axis. Periodic Motion: When the motion is repetitive after a fixed interval, it is called periodic motion, e.g. motion of a wing. Early man used to walk to travel. With the passage of time, man began using animals to transport people and luggage. Boats were probably built after seeing the shape of aquatic animals. Initial boats were made by making hollow in wooden logs. The shape was later refined into streamlined shape. Discovery of wheel dramatically changed the modes of transport. Animal driven carts could become a possibility after the discovery of wheel. Steam engines brought the next big revolution in the modes of transport. Steam engines altogether replaced the animal driven carts. Railways network spread because of steam engines. Internal combustion engines made it possible to replace steam engines. Moreover, internal combustion engines also made it possible to make vehicles for personal transport. Jet engines helped in making the aircrafts faster.